Home > Boxing > FIGHT PREVIEW: Can McKenzie upset Ramirez in his own backyard? FIGHT PREVIEW: Can McKenzie upset Ramirez in his own backyard? Ovill ‘The Upsetter,’ McKenzie (25-12, 13 KOs), will be hoping to live up to his nickname when he challenges Victor Emilio Ramirez (22-2, 17 KOs ) for his IBF World Cruiserweight title in Villa La Nata Sporting Club, Benavidez, Buenos Aires on Friday night. McKenzie received the opportunity to fight for the world title at short notice, following the IBF’s decision to strip Yoan Pablo Hernandez of his cruiserweight belt for failing to make a defence in thirteen months. The interim champion, Ramirez has been elevated to the status of full champion and this will be his first defence. The fight will be a dream come true for McKenzie, 35, as it represents his first tilt at a world title. 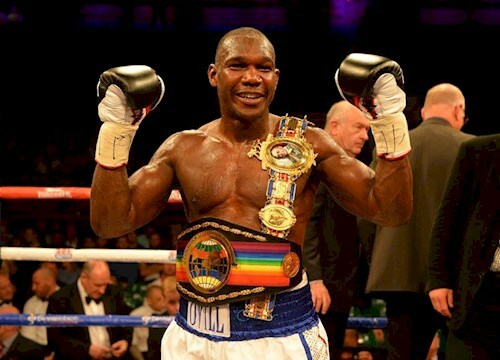 He has largely campaigned at domestic level, holding the Commonwealth Light-Heavyweight title in 2006. He lost that in his first defence to Dean Francis before suffering back-to-back defeats to Tony Bellew for the British and Commonwealth titles in 2010 & 2011 and most recently being stopped by Enzo Maccarinelli in a challenge for the Commonwealth title in 2013. In 2014, McKenzie stepped up to Cruiserweight and claimed the Commonwealth title in his first fight at the weight with a fifth round stoppage of Tony Conquest. Since then he has registered three wins in a row, including two by second round stoppage. However the task of going into the champion’s backyard and taking the world title away from him seems monumental. Ramirez is the former WBO World Cruiserweight Champion, he lost that title to Marco Huck by point’s decision in 2009, but since then he has won seven on the bounce. Ramirez is a short, squat fighter. He will be giving away height and reach advantages to the challenger but he carries significant power. He demonstrated both his power and resilience in his second last fight with Deon Elam, which saw him rise twice from the canvas in the first round, to stop his opponent in the second round. The physical nature of this fight will not concern the champion, with his last four opponents having enjoyed significant height and reach advantages over him. Like the boxing equivalent of a lumberjack, Ramirez has the conditioning and ability to wear opponents down with his power punching. The odds are stacked against McKenzie with this one, his greatest downfall is that he brings to the fight a journeyman record built largely against domestic level opposition. However, he has improved significantly with his move to Cruiserweight. That said, travelling to Buenos Aires, he will not be expected to win but this, but it has the potential to be an exciting slugfest, however long it lasts. Watch the IBF World Cruiserweight Title Fight LIVE on BoxNation at 2am on Friday night, 2 October. Did AP ruin his chances of playing this season… or ever?